Re: The Red Sun God? Why did Egyptians have a red sun God? The ‘outsizing’ of Mars (and any other possible rogue bodies) by Hatshepsut/Venus is recorded on the walls of her mortuary temple at Deir el-Bahri. your previous post about how the planets/moons moved across the sky is awesome. i know you have lots of content to write for you own books/site but do you have a rough guide to what happened and where the planets were in the skies that you are going to put on your site? i know that Mo is very interestrd in mapping the planets paths/positions in the sky ... would you have say an short example of 1 planet with your suspected dates and then we could see if there is anything else to tie it into around the world or be able to see how you came to the conclusion? Ramesses II before the gods Ptah (Jupiter) and Sekhmet (fiery sky). In the context of the God King Scenario Ramesses ("Fashioned by Re," "strong and right like Re," "The Re of rulers.") was one of the many guises of Mars. I see the above images as Mars/Ramesses (in conjuntion with Jupiter/Ptah) acting like electrical generator as it travels through Earth's plasmasphere or simply passing through the suns atmosphere. Either way electrical streamers/filaments were observed surrounding Mars/Ramesses and these took on tree-like apparitions, exactly as depicted. Ramesses, one of the many guises of the warring Mars. "son of Re, of his body." "strong and right 'like' Re, chosen of Re." "thou art Re, thy body is his body." "Lo, I was Re over the people.."
"Shining upon the Horus-throne of the living like his father, Re, everyday"
"They praised this Good God (Ramesses), magnifying his beauty in his presence." "... our king, our Lord, our Sun..."
"Who makes all men live when he has shone on them." And so on, and so on as with numerous pharaohs of the NK. It is clear a celestial body in the image of the red sun is being spoken about here. Selective reading? Absolutely not, I simply opened Breasted's book and spent five minutes reading a few paragraphs! It begs the question as to why scholars are completly oblivious to such celestial connotations?!! The Pharaohs new clothes? why did the Pharaohs have see through dresses? looking at Ramesses II he also has that "skirt" on which could be his cometary tail or something to do with Mars atmosphere/magnetosphere? Are his legs the twin tail? image on the left how a planet turned into a comet planet would appear and image on the right showing how comet venus appeared - was the atmosphere pushed into the shape? are the lines in the skirt birkeland currents? what is strange abou the skirt is that it is see through. if its a skirt then it covers his legs and there is zero need to show his legs. therefore, and i dont like to do absolutes, it is not a skirt. gary, just wondering if you have any thoughts on egyptian art and why they painted the kings/gods in that strange way with the body/arms/head at different perspectives. or is perspectives and the God King Scenario what its all about? The kings (and some queens) were often shown wearing pleated see-through attire. Sometimes this would take the form of pleated pyramid skirts. Some look like a distinct pyramid (as below) others less defined as in the image of Ramesses in his 'electrical tree' above. The transparent attire has little to do with cometary tails. Tails when observed were, as with the statues dedicated to Ramesses/Mars at Abu Simbel and the comet Venus images represented in the headgear, and overall symbolically represented in the traditional Pharaonic beard. The key here is again the dust and debris of earth's rings and possibly the ecliptic haze which in all probability was swept into rings (stripes from earth) by planetary bodies and lesser moon sized debris. Saturn's rings are a good analogy. Now compare the above with the 'stripes' frequently worn by Egypt's monarchy and I think you'll see what I'm getting at. The nemes striped headcloth and transparent attire invented as a direct result of the astral pharaohs appearing within and illuminating the dusty stripes in the heavens. The lines or stripes above were also responsible for the pyramid skirts. The above NASA photo shows the effect of one of Saturn's moons 'gravitationally' perturbing its rings. It is natural to assume the astral kings had a similar effect, forming shapes and shadows with in earth's rings (or ecliptic rings). I believe one of the most distinctive shapes formed was that of a pyramid, although in actuality this may have been a straight line that appeared to fan out from earth's POV (An analogy would be a road off into infinity). Although I cannot find any distinct pyramids shapes in Saturn's rings, some moons do form shadows, these from Saturn's surface would appear pyramid-like. Of course we have to take into account the angle of the Sun. But it's possible the planets generated their own or reflected light and from earth's POV these looked like pyramids. This is the reason why numerous kings were depicted wearing such unusual pyramid skirts and the very reason why they built some 90-odd pyramids. The Nubians in the south also build hundreds of pyramids although these took on a much more of an acute angle. Perhaps further south, and due to earth's axis, the sky pyramids appeared more acute. Ramesses/Mars II replete with pyramid skirt and the disk of Mars above his head. Tuthmosis/Moon offering to Hatshepsut/Venus, again pyramid skirts. I knew I'd got this somewhere! Senenmut/Mars in the background (hence smaller) offering to Hatshepsut/Venus in the foreground. Senemut Mars also wearing the pyramid skirt. Only in a world of cosmic catatrophe can we make sense of such imagery. Will get back to you on the other bits soon. If there were rings around the Earth then pointed 'pyramid' skirt could well have only be seen looking in one particular direction. From Egypt that was presumably a southwest direction assuming the rings were above the equator. The point would be just above the horizon in a southwesterly direction. Thus the positioning of planet Mars, when electrically interacting with another body, could have been indicated by the pointed skirt. And opens the possibility of other directions and positions in the sky being depicted by various items. The imagery of the Egyptians reveals much as to the location, attributes, behaviour, etc. etc. of our planetary kings. We can use the pace and the daily motion of the Sun as a measure. If the monarchy are depicted sailing, then, this means they crossed the sky at roughly the same pace as the Sun. If they accompany Re in his boat, or adorned the common epithet 'beloved of Re' or 'chosen of Re' (very common with NK kings) I would guess they were near to, or as good as followed the path of the sun very closely. If the king is shown seated on a throne, this implies a more or less stationary body, a body such as Mars in a geosynchronous orbit with earth. The actions portrayed should then give us a good idea as to what Mars was doing while seated on his divine throne. For example some images depict a seated Tutankhamun/Mars ('Lordly manifestation of Re') offering to his wife Ankhesenamun (wearing the comet Venus crown). As below. Mars and Venus in conjunction. Comet Venus sucking volatiles from Tut/Mars in an almost stationary event. Above is Tut/Mars and his wife Ankhesenamun/Venus taking a leisurely cruise on the celestial Nile amidst electrical spites (lotus flower). Mars and Venus in conjunction 'sailing' at roughly the same leisurely pace as the Sun. 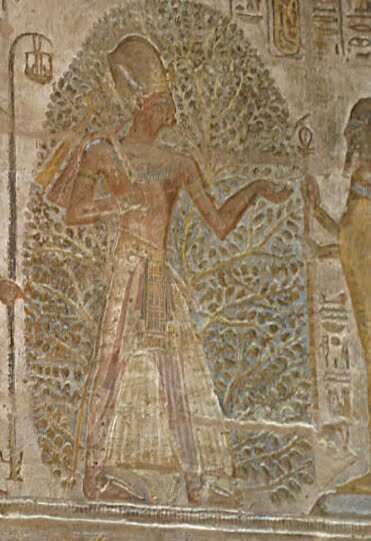 Note Ankhesenamun offering lotus flowers (Sprites) to Tut, this reveals gigantic Sprites were once observed emanating from Venus, probably in the direction of Tut/Mars. Perhaps I should make a prediction and say sprites will one day be discovered discharging from Venus?? 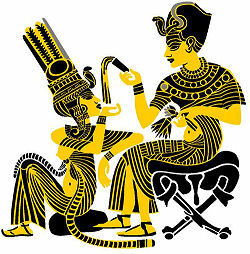 To my knowledge there seems to be a number of seated kings around the time of the Amarna Period. This would tie in with my time scale of the electromagnetic extraction of Mars' core to become the planet Mercury (7-8th century BC). Mars locking into orbit above the Himalayas, the larger magnet of earth sucking out the smaller magnet of Mars and dumping *hitloads of vaporized sand across Asia and Africa in the process. Forming one enormous iron-rich sand scar http://www.thunderbolts.info/tpod/2010/arch10/100408sahara.htm. If the king was shown fearlessly charging into the enemy in a chariot of gold and electrum. Then I would suggest that this was a planetary body obtaining a faster speed than the Sun, vanquishing up the countless tons of debris (enemy) in the process. The iconic 'smiting' scenes where the pharaoh is depicted standing and in the act of dispatching the enemy, was Mars (or other bodies) appearing as good as stationary, battling up debris. Quite possible a siege (the accompanying text may reveal more). If the king is shown offering to Harmakhet (Horus in the Horizon). This would be Mars literally appearing in the thick dusty band of earth's atmosphere (Horus being the embodiment of kingship - Horus, the protector of the gods). This occurred many times as Mars locked into orbit above the Himalayas. From the local of Egypt, this was Mars in (to us today, on) the horizon. The kings offering to Hathor - Mars seemingly residing peacefully in earths rings (although in actuality, still battling itself to death). Offering to Isis, bodies residing within the ecliptic haze. Offering to Amun or accepting the sceptre from Amun equals Mars amidst an aurora dominated sky, and so on and so on. Each image has to be taken on its own merit. We also have to take into account a certain amount of symbolism. I'll try and dig out a few more pyramid skirt images. review by Society for Interdisciplinary Studies of gary gilligans "Amun - an Ancient Aurora filled sky" TPOD that was on thunderbolts. showing how his idea may fit into and explain other myths and legends. which is the sign of a good theory or idea. At www.thunderbolts.info April 28th, 'Picture of the Day', ... 'Amun - an Ancient Aurora filled sky' by Gary Gilligan. He claims the Egyptian god Amun wears a crown that is the aurora - sacred colours that have been eroded or flaked away from stone monuments over the millennia. The parallel is of course with the bright tail feathers of the quetzal bird, cognate within the Mesoamerican god Quetzalcoatl. Such stone statues and monuments, even temples and buildings, were once colourful affairs. Sometimes these can be put back into place by computer simulation - but generally, most of the evidence has been lost - or even brushed aside by archaeologists intent on the visible object in front of them rather than it's detritus on the ground. Apparently, Mesopotamian ziggurats were colourful buildings - reflecting aurora (perhaps). Therefore this particular post on Thunderbolts is relevant, and in the same vein. Amun is commonly shown in a human form standing or sitting on a throne and wearing a red flat topped crown with two tall plumes. He also holds a sceptre - symbol of the thunderbolt. Amun was especially popular in the NK period (mid to late 2nd millennium BC) and he was known as King of the Gods (at that moment in time). Gilligan produces an image of Amun with blue skin, a yellow kilt and red crown. 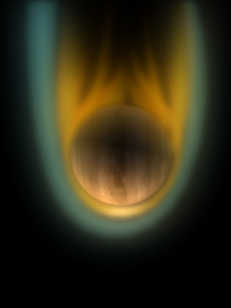 the two tall plumes are segmented into blue, red, and green. He then compares this with a photograph of aurora and suggests the crown is a symbolic representation of an intense geomagnetic storm. A wonderful insight. Amun was also known as 'the hidden one' - possibly reflecting the transparency of auroral phenomena, 'whose true form could never be known' (the undulating shape shifting nature of aurorae). Gilligan then says the solar wind is deflected around the earth to form an enormous magnetic tail divided into two lobes rising and setting in opposition to the Sun. Nowadays this is invisible but he speculates it could account for the two mountains as in the title of Amun, Lord of the Two Mountains (and parallels with myth elsewhere in the world are obvious). This is possibly why he was adorned by two plumes, Gilligan thinks, rather than a single one (and we may note the tail feathers of the quetzal bird are also two). In addition, Gilligan has found a parallel between the blue skinned Amun and the Anglo Saxon god Woden - the colour of blue appears to play a major role in myth (see also the blue Krishna for example). Tal-Qadi slab: evidence of solar system chaos and planets orbits changing? Tal-Qadi slab - worlds in collision? is the Tal-Qadi slab evidence of solar system chaos and planets orbits changing? below is a quote from the great book Malta: Echoes of Plato's Island that suggests Malta was the island of Atlantis. Kurt Schildman is the President of the Studiengemeinshaft Deutscher Linguisten. He deciphered the Indus script in 1994, and has since identified variants of this archaic script in several sites. According to Schildman, the inscription on the Tal-Qadi slab is in old Sanskrit, an earlier medium of communication than the indus script. His translation of it runs thus. The earth, counted from outside, the seventh planet. The increasing moon, a symbol of power, some event is taking place. The large mighty femal planet has arrived, the forth planet in our solar system, counted from outside"
You can view the Tal-Qadi slab at the National Museum of Archaeology, Republic Street, Valletta, Malta. This is what i wrote about it a year or so ago "Is this a Maltese Temple Builders Solar/Heavenly Calendar os it it an ancient historic record of an Electrical Universe event seen in the skies?" It makes no sense as a calendar but looks more like a record of something important that had happened. the image and quote below was sent to me by a member of the forum, i hope they dont mind me posting it here. I attached an image that you have in your forum that talks about Mars and Venus. accurate image to work with. layers being the creators of the universe and all that exists. These symbols can be interpreted all kinds of ways I guess. The duality of magnetic force is exactly as is detectable. I spent half a day last week in the Assyrian and Egyptian hall of the british museum, it is amazing how nobody questions me dowsing in there. The statues are manipulating the flows about themselves, they are functional, not decorative. any statues in particular that you can explain what was happening or can you expand on what was happening? is it similar to menhirs or are they different? do you get it with any old christian statues? ** colour of queens center orb= venus as seen in the skies = different colours = different conditions of venus. ** Why black plumes of Hathor though? Comet West or comet planets as inspiration for egyption crown plumes? Comet Hale-Bopp. did venus as a planet comet inspired nefertaris crown? ** at start comet venus = osiris (whiteness in the heavens). Osiris king of the gods. eventually Venus settled down into its orbit and became the queen to whatever planet/pharaoh was ruling the skies at that time. the original image of comet venus symbolised kingship and other normal comets reminded egyptians of the original white crown so it remained as the symbol of the ruler. ** no king or pharaoh crowns have ever been found!